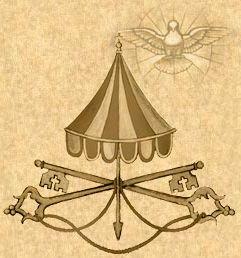 As I type these words tonight, there is no Pope heading up the Roman Catholic Church. This is rather significant in terms of world affairs and religious news: only once in a long while is there a transition of power in this position, and never in the past several generations has there been a Pope who has resigned, like Benedict XVI has done. This is the kind of thing that gets my religion-antennae perked up! The Church of God has had a mixed view of the Roman Catholic Church (which I’ll abbreviate RCC) since our inception in the late 1800s. Originally, we viewed the RCC as an evil institution, one which embodied some of the most evil and grotesque images in the book of Revelation. This was rather fundamental to our identity as the Church of God and, for a while, seemed to be the primary way for us to view that group. Our view toward Catholics has become much more generous, generally speaking, in the past few decades. We are becoming more and more aware that many true, honest Christian believers exist within the vast 1.2 billion adherents that the RCC claims. Personally, one of my high school friends grew up as a United Methodist but converted to the RCC when she married one of my Catholic friends. Both are firm, fully-committed believers in Jesus Christ and are raising their children to know and love the Lord. Now, you’ll notice that I have not pursued priesthood in the RCC. I serve as a pastor in the Church of God movement on purpose, and I’m not about to switch loyalties. After all, my view of Christianity allows for a great deal of diversity of denomination. To quote one of our heritage hymns (by modifying its intent), “we reach our hands in fellowship to every blood-washed one.” I believe we must be very gracious in distinguishing who, in fact, is washed by the blood of the Lamb. So how should we react to the RCC being between Popes and struggling to search for a leader? For all its problems (and I believe there are many), the RCC is very important to a large number of honest Christian believers. To that end – and that end alone should be enough to convince us – we should pray for our Roman Catholic brothers and sisters during this time of transition. After all, we too are in a period of transition in the Church of God. Our current General Director, Dr. Ron Duncan, is retiring soon, and a search team is working hard to interview candidates and to make a recommendation for Dr. Duncan’s successor. (There are a few somewhat insignificant parallels between this process and the RCC’s Conclave to choose the next Pope. In short, though, our General Director is not our Pope.) Just as we should pray for God’s wisdom in guiding those who will select a leader for our group, which numbers about a million people, so too we should pray for God’s wisdom among those who will select the spiritual leader for a group one thousand times larger than ours.